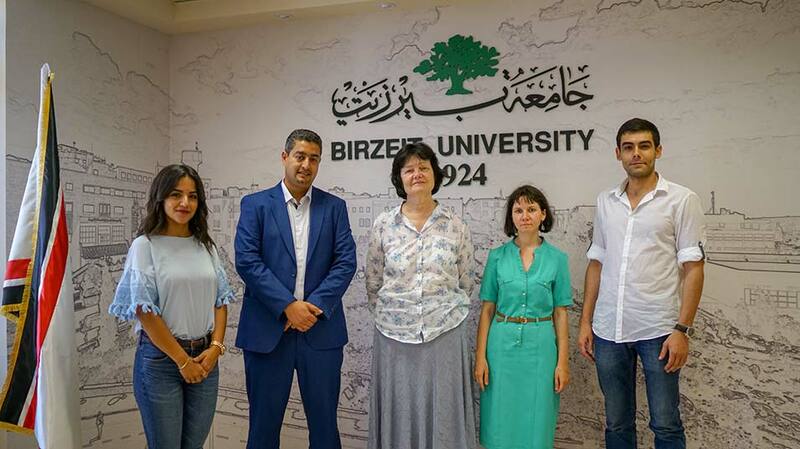 Uspenskaya Alekseevna, a professor of Arabic language at the Moscow State Institute of International Relations, visited Birzeit University on August 4, 2018, along with two international relations master’s students, as part of an effort to bolster academic cooperation between the two universities. Alekseevna’s month-long stay at Birzeit University included meetings with Birzeit University President Dr. Abdullatif Abuhijleh, External Academic Relations Officer Dr. Amir Khalil, and a number of international relations professors at the university. During their encounter with Khalil, Alekseevna and the graduate students discussed ways of improving academic cooperation between Birzeit and the Moscow Institute, with opportunities offered for further exchange of students and faculty members between the two universities. Additionally, the group met with Rasha Kassis, the administrative and financial coordinator of the Palestine and Arabic Studies Program, who introduced the program’s goals, methods of teaching, and courses available for international students. Alekseevna and the master’s students also met with Director of the Ibrahim Abu-Lughoud Institute of International Studies Dr. Lord Habash, and explored Palestine’s diplomatic relations with Russia, in addition to attending a number of lectures hosted by the institute. Birzeit University and the Moscow State Institute of International Relations had signed a memorandum of understanding on April 25, 2018, during a visit by Abuhijleh to the institute. The agreement provides opportunities for expertise exchange, student and staff mobility, and cooperation on research, development, and publication.